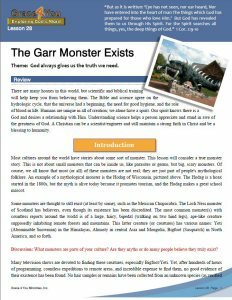 Lesson 28: The Garr Monster Exists | Grace 4 You Ministries, Inc. Most cultures around the world have stories about some sort of monster. This lesson will consider a true monster story. This is not about small monsters that can be inside us, like parasites or germs, but big, scary monsters. Of course, we all know that most (or all) of these monsters are not real; they are just part of people’s mythological folklore. An example of a mythological monster is the Hodag of Wisconsin, pictured above. The Hodag is a hoax started in the 1800s, but the myth is alive today because it promotes tourism, and the Hodag makes a great school mascot.